While AdWords can be an incredibly effective form of marketing, it can also become a huge waste of money if your campaign isn’t correctly configured and monitored. 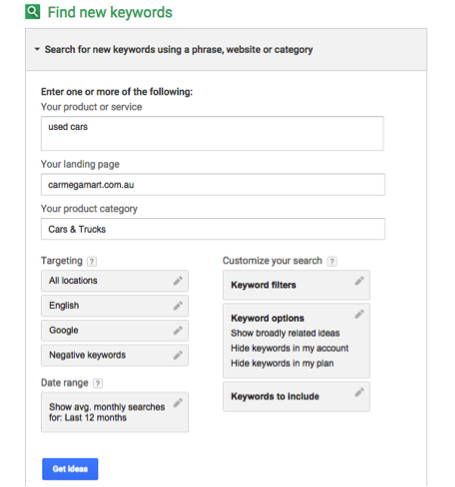 As such, the team here at Marketing.com.au thought that a series of ‘How to’ articles, all targeting effectively Google AdWords strategies, tips and tricks might just be in order. We’ve already run through How to Set Up a Campaign in 10 Simple Steps, so today, we thought we’d run through how Google ranks adverts based on relevancy and quality score. AdWords is Google’s platform for PPC advertising. It is basically a way for you to pay to have an ad for your company or product appear on a relevant Google search engine result page (SERP). Advertisers bid on specific keywords, so that their ad appears when someone enters the keywords against which they are bidding into Google’s search engine. Users are able to set a budget for their advertising campaign, and only pay when people actually click on their advertisements. How Does Google Rank Adverts? As with most things Google related, relevance is the most important factor. 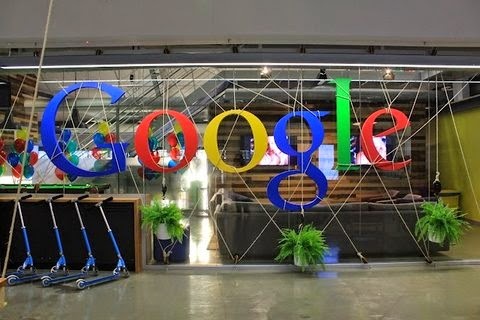 Google wants to connect users with companies and products that match as closely as humanly possible with their search queries. If you provide this relevance in your advertisement, then Google will reward you with a higher quality score. Your quality score has an enormous bearing on your campaign, not just because it helps to determine your advert’s position, but also because Google will charge you a lower cost-per-click (CPC) price if your ad has a high quality score. Basically, for your advert to be relevant and achieve a high quality score, your keyword choices must matches the message contained in your ads. For example, if someone searches for your keyword(s) and your ad shows up, would your ad seem directly relevant to their search? There are three possible relevance statuses that Google will reward with: above average, average, or below average. Obviously, if you receive a ‘below average’ score, then your advert isn’t going to be displayed too often. Then, simply click on the ‘Get Idea’ button and the tool will generate a list of suggested ad groups and keywords for your campaign. These lists rank ad group and keyword ideas in order of their relevance as well as giving an idea of the bidding price they will attract. For example, if you attach your ad to the ‘best used cars’ keyword phrase your ad could appear 27,100 times a month, which is an enormous amount of exposure but it also means your ad could be clicked on 27,100 times and you’ll owe Google $2.28 for every click or $61,788. At that rate, your daily budget will disappear very quickly. 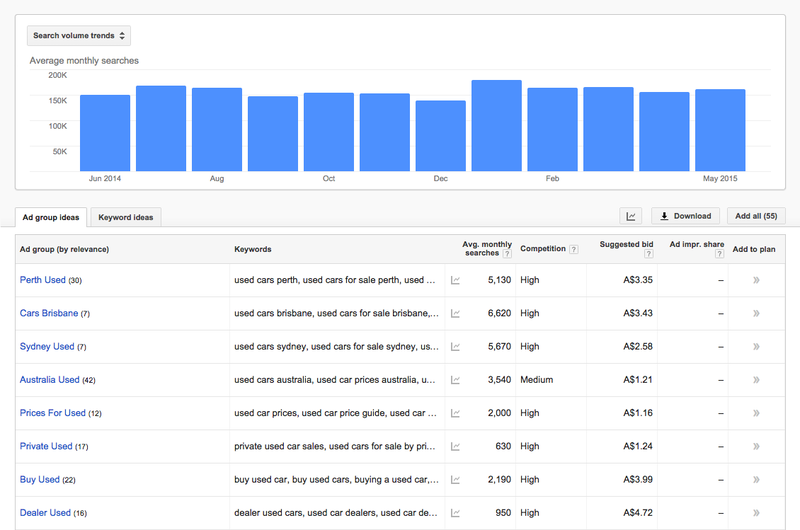 This is where relevance and understanding how AdWords operates is crucial. This list was compiled simply by typing in ‘used cars.’ It’s important you narrow down your search by including factors such as location – if you’ve got a used car yard in Melbourne, you might not want to be paying for people in Perth to click on your ad. If you only sell used Holdens, you don’t want to be paying for people clicking on your add who are looking for used BMWs. You can account for these factors by creating a quality add that targets keywords that are specific to your advert, and specific to your specific. A good ad will lower your costs, give you a better quality score and generate more traffic from qualified leads, rather than random clickers. Make sure your Ad Groups are spot on: you want to create an individual, specific ad group for each your specific products or services. The idea is have anywhere between 5 and 20 keywords per ad group. So, rather than create a generic advert for your ‘used cars’ business, and then lump 75 keywords in there, create a whole series of smaller, more specific ad groups. For instance, you might create an ad group for ‘used cars in Melbourne’, or you might be even more specific and take it down to the suburb level. You might have another ad group for ‘used BMWs for sale’, or ‘used Holdens’. You get the idea—be specific! Make sure your ads are as closely related to your keywords as possible: if you have an ad group for ‘used BMs for sale’, then make sure all the keywords are specific to that. So, don’t have ‘used Holdens’ in there as well. Divide and conquer. Make sure your landing page matches your advert: if your advert is all about used BMWs, then make sure your landing page to which the advert reverts is all about used BMWs too. Not only will this get you a better relevancy score from Google, it should also lower your bounce rate: your users will land on a page containing the content for which they were actually searching! Try to include your main keyword in your Display URL: if you have space (which is not always the case), include your main keyword in the display URL of your advert. If you don’t have space, then at least try to include a keyword in the Final URL. This is where specific landing pages come in handy. Make sure your advert wording is spot on: there’ll be more about this in next week’s article, but be sure that your ads include your keywords and that they aren’t too creative. Be specific and relevant, not pithy or amusing. Improving ad relevance is well worth your effort. It results in overall improvement in the performance of your AdWords campaigns. If you improve your relevance, then your campaigns receive a higher Quality Score, which means your ads show in a higher position and translates into a lower cost-per-click, saving you money and getting you more clicks for a smaller price. It really is a win-win situation! 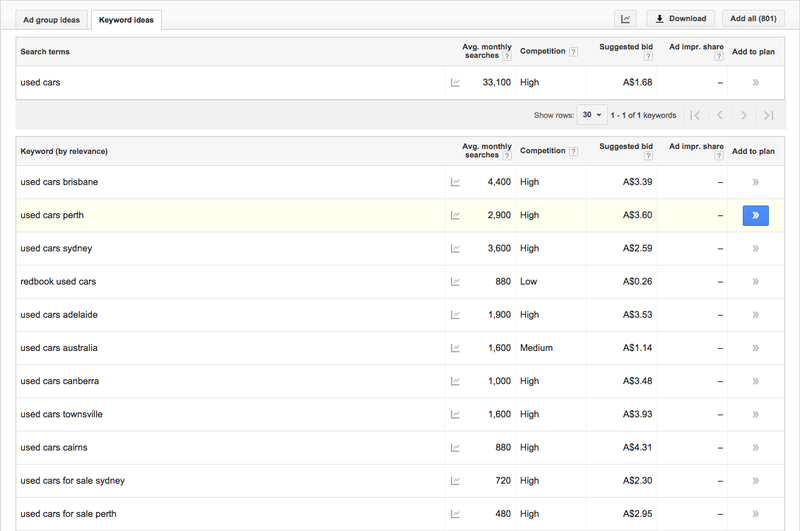 Tune in next time when we take a look at how to write compelling AdWords adverts.